Available at PetsMart or Amazon. Comes in bigger sizes too. Line the bottom with pine shavings that can be cleaned out periodically or also can be used with straw. We don’t recommend newspaper. Keep in a heated outbuilding or your garage until it is warm enough. You might still have one in the attic or a friend that has an old one. Can usually be found for less than $20 at 2nd Hand Stores like Salvation Army. Line the bottom with pine shavings that can be cleaned out periodically or also can be used with straw. We don’t recommend newspaper. Keep in a heated outbuilding or your garage until it is warm enough. Chickens, with the notable exception of Silkies and Frizzles, are by nature much more cold hardy than they are heat tolerant. We’ve worked hard to understand the needs of our customers all over the United States. 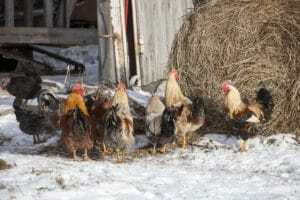 This article shares with you our thinking on cold weather backyard chicken ranching. The design concept of Urban Coop Company coops provides for three basic spaces for your chickens. (1) Roost Area (2) Egg Box Area, and (3) Run Space. Each space has its design goals taking into consideration cold and hot climates. (1) Roost Areas: The Roost area will be used by your chickens primarily at night to sleep. Exceptions to this will be when your birds feel they need additional shelter because of inclement conditions. They will seek shelter in the roost. Urban Coop Company coops feature enclosed roosts made from thermally neutral cedar (neither transmits cold or hot) and use updraft passive ventilation so that hens in the roost are protected from stagnant air issues. In hot or cold weather, air circulates from low to high and out the tops of the roosts even though they are enclosed and protected, making sure your chickens stay healthy year round. Just the way our coops come, chickens have a good way to deal with inclement weather. Chickens are very temperature hardy, much better at dealing with extreme cold weather than extreme hot. Poultry experts agree that a dry, wind protected adult chicken allowed to feather up prior to the winter season, can do just fine in freezing temperatures… even sub zero temperatures. Oddly, overheating of your chickens and frostbite issues have a common root cause…poor ventilation. Frostbite is driven by sub freezing temperatures and overly humid coops that are too enclosed. In the worst coop designs, humid sub freezing temperatures exacerbated by the chickens poop moisture (common with poop trays) and respiration can cause frostbite on exposed combs and leg skin even on a dry chicken. Heaters and light bulbs must be used with great care as they introduce the risk of electrical fires and can actually cause fowl to not “feather-up” the way they otherwise would, and in a power outage, it potentially leaves them without their full natural feathering to keep them warm. (2) Egg Box Areas: For a different reason, egg box areas are enclosed too. Darkness. Chickens will naturally want to lay their eggs in the darkest most cozy areas of the coops. Our egg boxes, for the same reasons as our roost, afford your chickens refuge from poor weather conditions while they are laying yet keep critical fresh air circulating around them. (3) Runs: Runs are just that…run areas for your chickens…a place for them to get outside and forage around. Our run areas have roof areas over them to provide some shade and some protection from normal rain and snow accumulation. At the same time, our runs allow sunlight to shine in too. Sunlight drys up your coop areas, the ultraviolet light disinfects your coop and helps control odors, and in fact as with most animals, chickens need sunlight. So they are necessarily more open than roosts and egg box areas. In extreme stormy conditions (wind driven snow and rain) your chickens even though it is daytime, will seek shelter in their roosts. They’re now out of the storm, but confined to a smaller space. So that the run areas can have both the openness that’s appropriate the vast majority of the time, but to extend use of the run in seriously stormy weather, we’ve introduced optional Fowl Weather Storm Panels™ that will add temporary additional inclement weather protection to run areas. You don’t have to have them, they just give more sheltered space to your flock when it’s stormy outside. For many of us, chickens have become pets. Leaving fido out in inclement weather is just not usually an option 🙂 With that said, pets or not, chickens are still livestock. An adult chicken given good choices for different shelter areas (roost, egg box, run) can figure out what areas they need to be in to deal with the weather. Depending on your world view, they’ve been doing it for somewhere between 10,000 and 10 bizillion years. We’ve only had electricity for a little more than 100 years and chickens have certainly done well for much longer than that all over the world. The fact is that cold isn’t as big a problem with chickens as heat. They can withstand very cold temperatures (even subzero) as long as they are fully feathered adults. Generally a chicken is fully feathered out by the age of 12 weeks, but does sometimes depend on the breed. If your chicken has full wing feathers and feathers over it’s neck and middle, it’s safe to consider them fully feathered. If you have a Round-Top Backyard Chicken Coop™ make sure to place your roost door away from the prevailing or coldest North winds just to give them a bit of extra protection, or you could get a Snow / Storm Panel kit which includes a cover for that door. Lower your roost wings on your Mobile Coop and the roost area becomes a great place to get out of the weather. Likewise, the Walk-In Coop has a giant enclosed roost area where your chickens can seek refuge if they think they need it. The problem with cold and chickens actually comes from moist cold air. Moist cold air causes respiratory problems and can cause frost-bitten combs and wattles in very cold temperatures. The roost-over run design of the Round-Top Backyard Chicken Coops™ takes this into account and provides ventilation through the roost floor and allows the cold moist air to dissipate out the top round vents. The roost bars are positioned to allow the chickens to roost near the top where the air is warmest, but out of direct wind. Keep water from freezing by using some sort of a submersible heater or heated chicken waterer. If you have the Easy Fill Waterer, we have designed it for a particular heater and all that is needed is the slotted cap. Extra shavings in a sloppy coop run bottom can absorb water and help keep your girls feet dry. Do not use straw or hay as it holds moisture and turns into a mildewy matted mess. On really cold sub-zero days, you can use a bit of Vaseline to coat combs , waddles and exposed leg skin to protect from frostbite. Cold birds will huddle up together to keep warm and in the heat, the opposite is true. Be careful if you decide to use a light-bulb or a heater. The electricity presents an electrocution and fire hazard and you may in fact be doing harm. IF you provide too much supplemental heat, birds natural reaction is to not feather up as much. IF you were to lose electricity in a cold spell, your birds would be without some part of their best natural defense against cold…their feathers. Keep unfrozen fresh water available to your hens. Hydrated birds deal with cold better. Dry, fully feathered chickens who can get out of the wind are very, very cold hardy. They will be fine in freezing temperatures (even sub zero temperatures) so long as they have access to fresh water and stay dry. Some particulars may vary breed-to-breed, for instance Silkies and frizzle-feathered chickens are less cold hardy. The above points will certainly give you a safe place to work from. Contact us if you have winter chicken keeping questions. While we live in Central Texas and only have 30 or so freezing days each year, we have 100’s of customers in places like Maine, Connecticut, Massachusetts, Minnesota, Colorado and many other very cold places. We literally get NO reports of cold weather related chicken deaths with our coops. We’re happy to share with you what we know. It’s certainly not the cheapest wood coop builders could use, in fact, its one of the most expensive. But just like a fine chef, its impossible for a coop builder to end up with a great product if the ingredients aren’t the best. • Cedar is lightweight and dimensionally stable. It lies flat and stays pretty much straight, which means it resists the natural tendency to crack and bow as you might find in many other wood species if used outdoors. Its special cell structure fights moisture rot by allowing it to dry out faster than almost any other wood, time and time again. • Western Red cedar is incredibly thermally efficient, meaning even on hot days it is cool to the touch and does not transmit heat to areas inside the roost, or for that matter, cold either. Its warmer in winter and cooler in summer. • Cedar is naturally bacterial and fungal resistant. Cedar is 80% the strength of oak which one of the strongest hardwoods. These facts coupled with its rot resistance make it the most desirable wood to build outdoor structures from… like coops! • Western Red cedar fibers contain oils that act as natural preservatives to help the wood resist rot and decay making it excellent even in humid climates. Even without special treatment, cedar will easily last outdoors 10-15 years and in some circumstances, much longer. • Naturally occurring organic compounds called (thujaplicins) give off that distinct cedar aroma that is pleasant to humans but a deterrent to insects, moths and other wood pests. These oils are locked into the boards and are what makes the wood so resistant to bugs and also rot. Don’t confuse western red cedar lumber with eastern white cedar (aromatic cedar) shavings. Western Red Cedar Lumber is absolutely, 100%, NOT DANGEROUS TO CHICKS or FULL GROWN HENS. Unlike Chinese fir, plastic or painted pine coops, Western Red cedar will not bow or sag over time and will stay looking great. Your cedar chicken coop will hold its handsome appearance year after year with very little maintenance. Cedar products are an all around safer, healthier, natural material for coops and better than almost any other wood in the world. 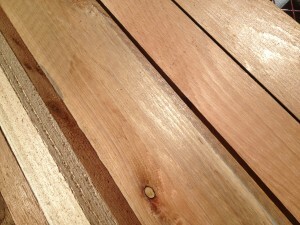 CEDAR PRODUCTS ARE A GREAT NATURAL ALTERNATIVE TO CHEMICALLY TREATED WOODS. The only other woods that are even close to cedar in its suitability for use as a chicken coop, are redwood and cypress. However, since cedar is more commercially available it is the most cost effective of the three. Want to paint it? Great… cedar holds paint better than almost any wood you can find and better than any other outdoor rated wood. Just pick any Big Box available semitransparent, transparent, or solid wood stain of any color you like, and it will last 8-10 years or more before you have to even think about repainting it. Buy the lowest VOC rated stain you can find. We do not recommend products like Thompson’s Water Seal around chickens. Don’t want to paint it? Great… no domestic wood outperforms cedar outdoors, even outdoor ground contact conditions. Left unsealed and unpainted, cedar will patina to that natural grey/silver look that people are familiar with over time and last up to 10-15 years or more depending on your locale. Want to seal it? Great… If you like the fresh Golden look of unweathered cedar, put a transparent non-colored wood stain on and slop it into the wood. Repeat every 6-8 years or when you see it fading. Wash up your coop before resealing, and it will come very, very close to looking brand new again, like the day it arrived.